BROOMFIELD, Colo., Sept. 5, 2018 /PRNewswire/ -- Noodles & Company (NASDAQ: NDLS), serving classic noodle dishes inspired by flavors from around the world, today announced it will once again team up with No Kid Hungry to work toward ending childhood hunger in America. By donating $2 to the campaign at participating Noodles & Company restaurants or online at noodles.com/endhunger now through Oct. 9, 2018, guests will receive a coupon for a free Shareable item to enjoy with their family and friends on their next visit. Every $2 donation helps provide up to 20 meals to kids in need. "With support from our guests, we've raised nearly $1 million for No Kid Hungry since 2016, making great strides toward ending childhood hunger in America once and for all," said Dave Boennighausen, chief executive officer of Noodles & Company. "With one in six kids struggling with hunger in our country today, there's no better time than now to empower our people, our guests and our communities to come together and positively impact the lives of those kids who need it most." Since No Kid Hungry launched its campaign in 2010, one-third fewer children are now facing hunger. No Kid Hungry and its partners have connected hungry kids with more than 775 million meals. "For the third consecutive year, we're so proud and thankful to have Noodles & Company's continued support of our mission to help ensure that no child in this country ever goes hungry again," said Diana Hovey, senior vice president at Share Our Strength, the organization behind No Kid Hungry. "With just the simple act of dining out and making a donation at Noodles & Company during September and October, we can all help make an immediate difference in a big way." Coupons for the free Shareable item are valid through Oct. 23, 2018, and are good for any size Korean BBQ Meatballs, Cheesy Garlic Bread or Potstickers. The coupon cannot be combined with any other offer. 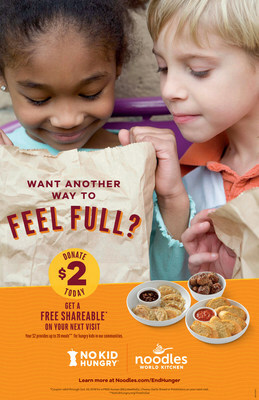 For more information on Noodles & Company or its partnership with No Kid Hungry, please visit noodles.com/endhunger. Since 1995, Noodles & Company has been serving noodles your way, with noodles and flavors that you know and love, to new ones you're about to discover for the first time. From indulgent Wisconsin Mac & Cheese to good-for-you Zoodles, Noodles serves a world of flavor in every bowl. Made up of more than 450 restaurants and 10,000 passionate team members, Noodles is dedicated to nourishing and inspiring every guest who walks through the door. To learn more or to find the location nearest you, visit www.noodles.com.